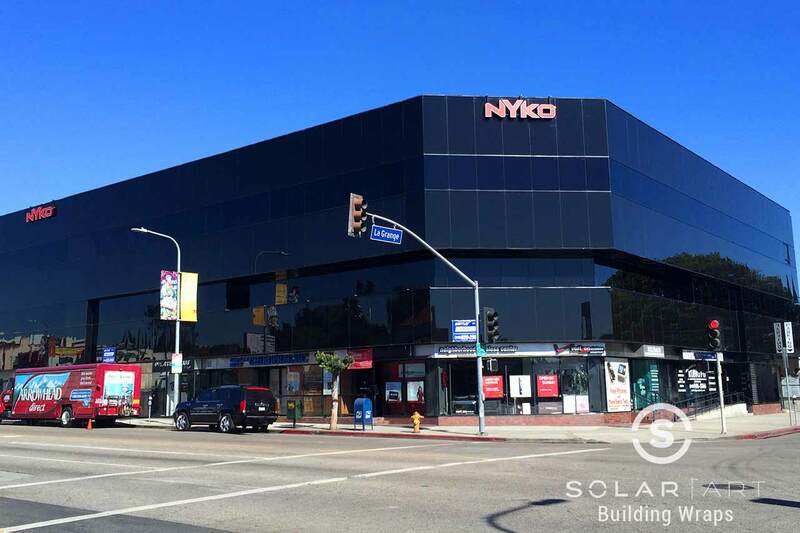 Solar Art installed exterior window film to the Nyko building in downtown Los Angeles, California! We installed a building wrap that completely changed the look of the building. Originally the outside of this building was dark and outdated. The customer was looking to update the look of the exterior to compete with newer buildings on the block. Curb appeal is very important to potential customers, especially in Los Angeles. 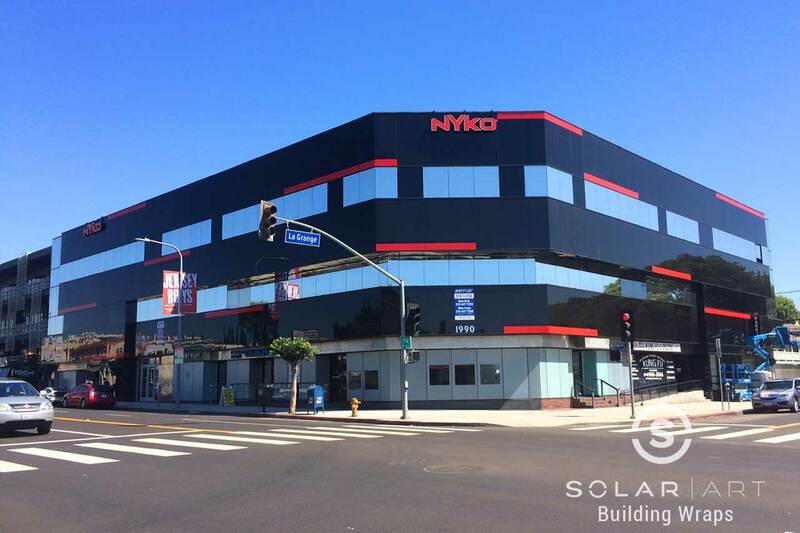 This vinyl building wrap was installed in phases since the project was so large. Phase one of the project included some of the vision glass being installed with Exterior Silver window film. Phase two of the project was to add red vinyl accents to modernize the look of this building. Phase three of the project included installing frosted privacy window film on all of the lower vision glass for storefront privacy. As you can see from this project, building wraps can have several benefits. Exterior window tint greatly rejects the amount of heat that enters the building. Depending on the film installed, exterior window film can reduce the heat by up to 75%. With building wraps, you also have the ability to add accents to spandrel glass just as a design factor. The frosted window film we installed to the storefront glass was to increase privacy and to prevent people from being able to see into the building. Vinyl window film is easily removable with no damage done to the glass. The customer can decide at any point they want to change the exterior window film or the frosted window film for another film. Building wraps not only reduce heat, but glare as well. The exterior window film and the frosted window film film both protect against 99% UVA and UVB rays. Exterior window film is installed the same way as solar film, anti graffiti film and security window film. Exterior window film and decorative window films such as frost also look great in homes! Interested in Exterior Window Film? Contact us directly to talk to us about exterior window film! Commercial exterior window film installations have many benefits. The window film rejects heat, which increases comfort and lowers utility costs. You can earn up to 9 LEED points with commercial exterior window film. Contact Solar Art to learn more!